← Who uses archives? And what for? Call me nostalgic but there is something just so wonderful about a letter – and by that I mean a real, honest to goodness handwritten, hand addressed letter. I’ve had many a conversation with archivists and other paper enthusiasts who’ve worried over the lack of letter writing, and the task of cataloguing e-mail correspondence rather than paper stuff. I did wonder aloud if some day people might look at our e-mails with their attachments, emoticons etc and go ‘aww look at that isn’t it cute’, though I’m still not convinced! This letter I catalogued yesterday is a prime example, with the added bonus of attached photographs! The letter is in a box ‘Rural Education’, in a file simply titled ‘Rural’ which only hints at the variety of material within. The letter was sent to the NUWT General Secretary by a former teacher after an NUWT request for information on the use of caravan schools and vans for teaching in rural areas. The teacher writes that she was in charge of the ‘Travelling Caravan Kitchen’ from July 1923 – July 1924 and she used it to teach classes in 10 village schools, staying 4 weeks in each, taking the 12 oldest girls for an intensive course of cookery, laundry & housewifery. 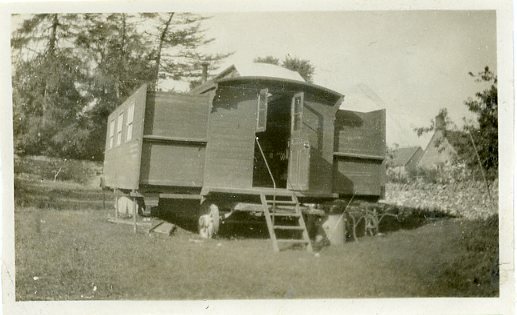 She says it is still in use now (1931) but “it is now at least 18 years old and would seem cumbersome now, since the great improvement and interest in caravan travel in these days; it is very heavy and took about 4 or 5 horses to draw it from place to place or a motor tractor which often damaged the ground…”. The photographs she sent with it are small, as you can see in relation to the letter, but they are wonderful examples of innovations in rural education at that time. On the back of the image of the exterior of the Caravan Kitchen she explained that it has telescopic sides which wound inwards for travelling. 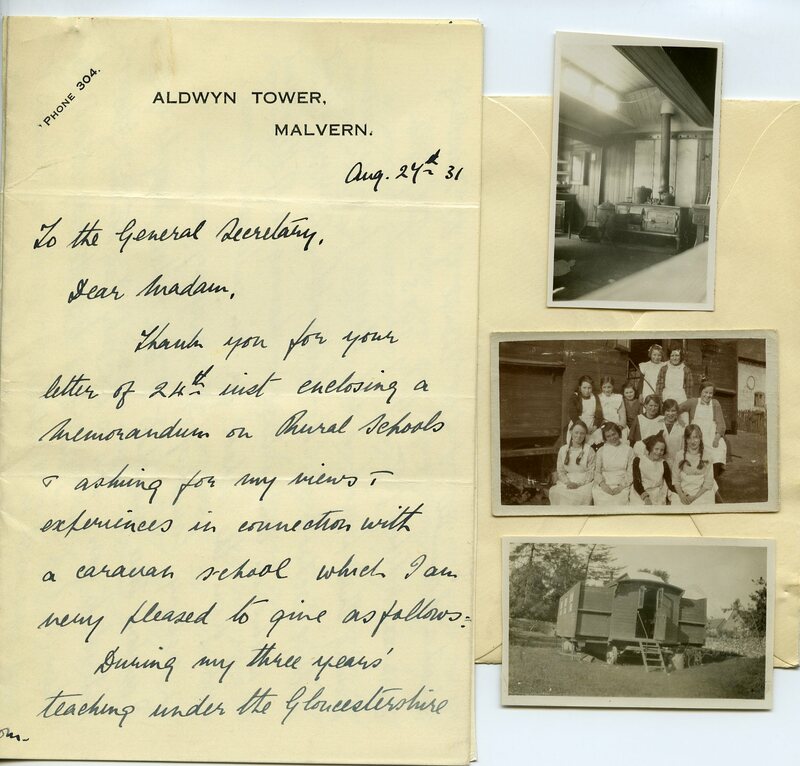 In the letter she discusses the impact of the arrival of the caravan on the communities she travelled to, saying “the arrival of the caravan caused tremendous interest.. & the course taken was much appreciated by the older girls about to leave school”. This entry was posted in Archives and tagged archives, National Union of Women Teachers, NUWT. Bookmark the permalink.